The Portable Steel Hardness Tester measures the hardness of metals in the range of 20 to 65 HRC on the equivalent Rockwell C Scale. The instrument is fully portable and easy to use. It can easily be carried anywhere an accurate hardness test is required. The slim design of the microscope allows the user to test in tight spaces which are not accessible to bench testers. The handheld automatic indenter is used to make a small indentation in the piece to be tested. The microscope is then used to directly "read" the hardness from the size of the impression on its equivalent Rockwell C Scale. Certification of the microscope and/or calibrated test block using standards calibrated traceable to NIST are available upon request for nominal fees. 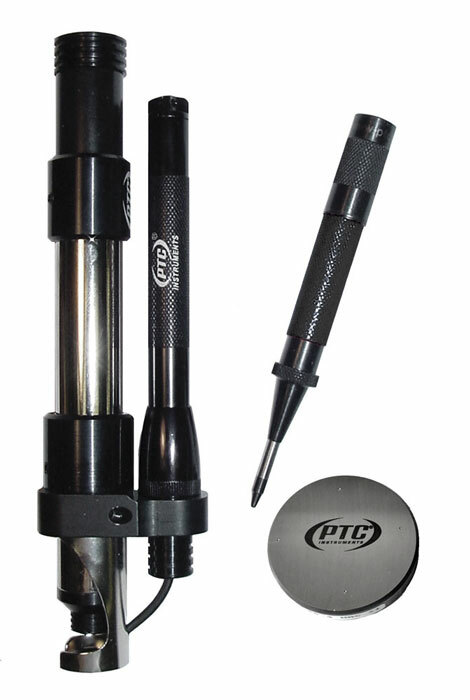 PTC® s Model 316 includes a hand-held impact indenter, an illuminated 60X measuring microscope, batteries, test block, hardness conversion chart, instructions, and carrying case. Carrying Case Dimensions 6 1/2" x 9 1/2" x 2 1/2"
Microscope Dimensions: Length 7 1/2"
PTC® products are covered by a limited liability warranty from defects in material and workmanship for one year from date of purchase. This warranty does not apply if, in the judgement of PTC®, the product fails due to damage from shipment, handling, storage, accident, abuse or misuse, or if it has been used or maintained in a manner not conforming to product's instructions, has been modified in any way, or has a defaced or removed serial number. Repair by anyone other than PTC® or an approved agent voids this warranty. The maximum liability of PTC® is the product purchase price. Prepare the sample by cleaning the surface with a piece of emery paper or steel wool. The sample should be at least as smooth as can be obtained using size 400-A emery paper. The sample, if small, must be placed on a heavy, smooth, hard surface when the indentation is made. This is to overcome a lack of mass in thin sections. Sheet metals to be measured should be at least 0.020 (0.5 mm) thick A smooth, hard metal surface must back up the sample. If the sample and the backing plate are not in contact, an erroneous reading will result. Hold the indenter in the hand at right angles to the surface of the sample. Slowly force the tip into the sample until the indenter trips. A clean, smooth, shallow cavity will result. Twist the barrel of the flashlight until the light comes on so that the base is illuminated. Place the microscope over the sample so that the hole in the microscope base is over the indentation. Center the indentation in the sight so that the reticle is tangential to the indentation. The hardness may now be obtained by measuring the diameter of the indentation with the scale in the microscope. The values are in equivalent Rockwell C Scale. Several measurements should be made as the sample being tested may have soft or hard spots. A marked and calibrated steel test block is provided for checking the accuracy of this instrument. IMPORTANT: When making this check, place the test block on a smooth, flat, heavy, and rigid metal surface. Do not read the factory made diamond indentation which was done to calibrate the test block. Indentations made with the Model 316 indenter are smooth and round; as opposed to the sharper, more conical shaped indentation made from diamond indenters. Only the test block surface with the PTC® mark should be used, this surface must not be re-worked. Tests must not be made any closer than three diameters, as previous indentations distort the hardness of the surrounding area. Make several tests of the test block. If the measurement of the test block does not check with the microscope, the instrument should be returned to the factory for recalibration.